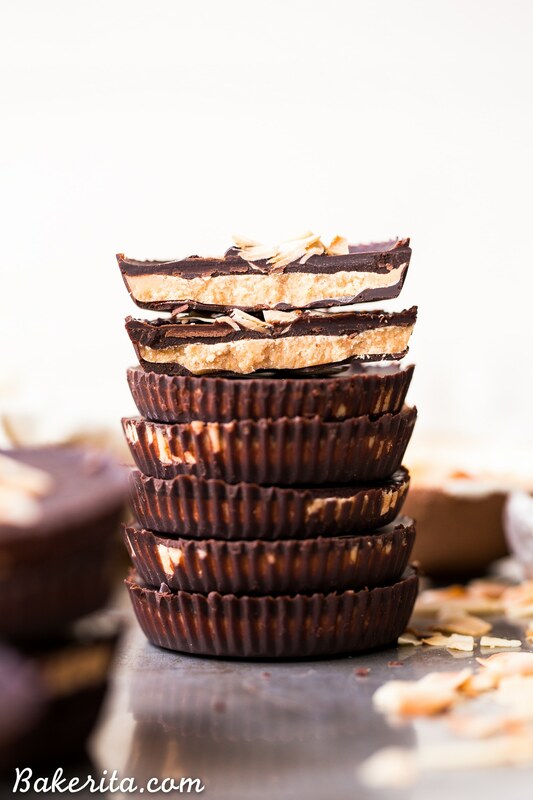 These Toasted Coconut Butter Cups are made with just four simple ingredients! Toasted coconut butter is the star of the show, encased in decadent homemade chocolate for a healthy homemade candy that will satisfy your sweet tooth. 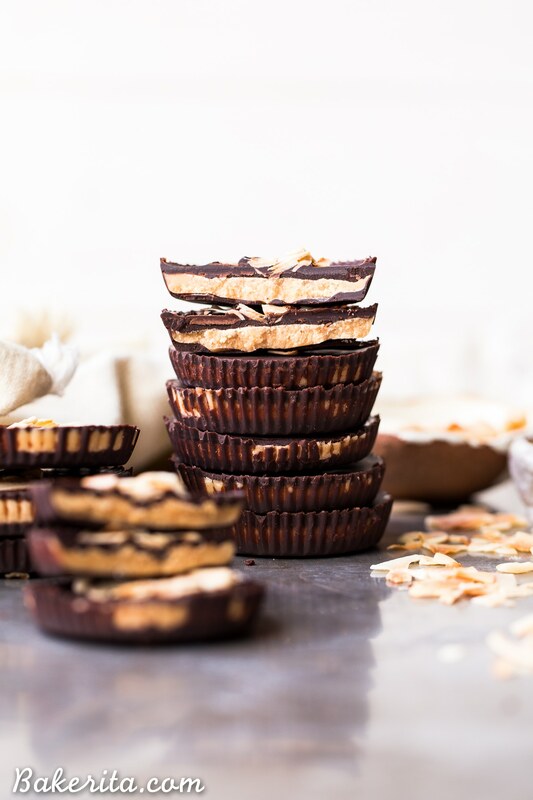 You’re going to love these paleo + vegan coconut butter cups. How are you with evening routines? I know a lot of people live by their morning routine, but for me (especially with a little pup), my mind is going in 1000 different directions in the morning, so it’s hard for me to stick with the same thing every day. Though, I have been trying to practice meditation more regularly in the morning. For me though, an evening routine is more my speed. I’m not one for going out (and haven’t been for a few years now…I’m an odd 24-year old), so my evenings are usually spent inside, relaxing, cuddling with my little Hank, and winding down from the day. Like clockwork, my evening ends relaxed on the couch, either with a book or watching TV, ALWAYS drinking hot tea (usually peppermint or cinnamon), and eating chocolate. The tea and chocolate always go together, with my chocolate dunked into my hot tea for just long enough to get it a little melty (but not so melty it drips into my tea). It’s dreamy, and it makes me happy, and it always caps off my day with the perfect amount of sweetness and relaxation. Lately, my chocolate of choice has been Eating Evolved Coconut Butter Cups – they are SO GOOD, but they are also not cheap at $3 for 2 cups. HOMEMADE TOASTED COCONUT BUTTER CUPS! And you guys, I could not be more excited about the results. If you’ve ever made any of my cups before, you’ve made my homemade chocolate. This recipe is similar, but I made one VERY important and exciting change. Historically, I’ve always used coconut oil because I always have it on hand, but I’ve always been annoyed at how quickly it melts on a warm day and I don’t always want the coconut flavor. This time when I started to make the chocolate, I had a bag of cacao butter on my counter and decided to use that instead. GAME CHANGER. 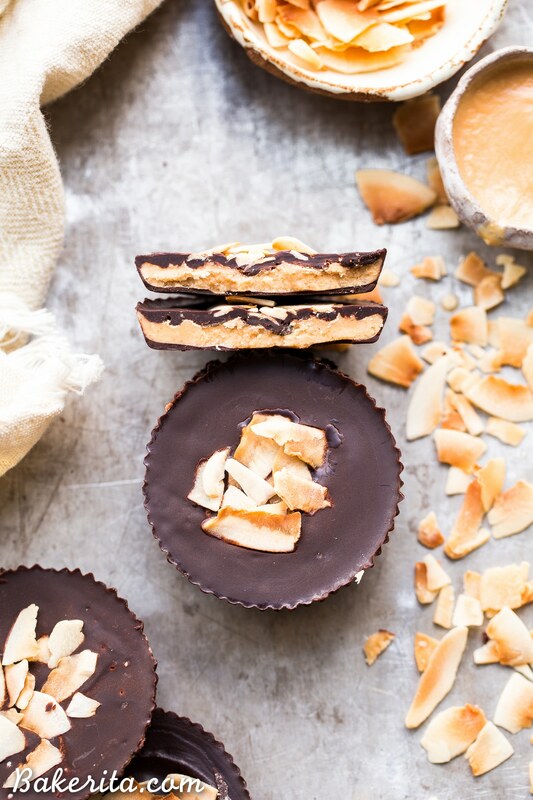 These Toasted Coconut Butter Cups are made with just four simple ingredients! 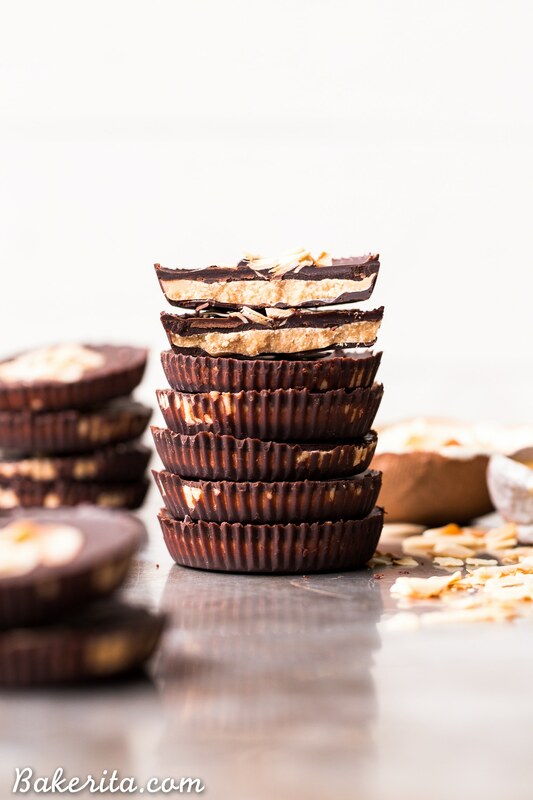 Toasted coconut butter is the star of the show, encased in decadent homemade chocolate for a healthy homemade candy that will satisfy your sweet tooth. 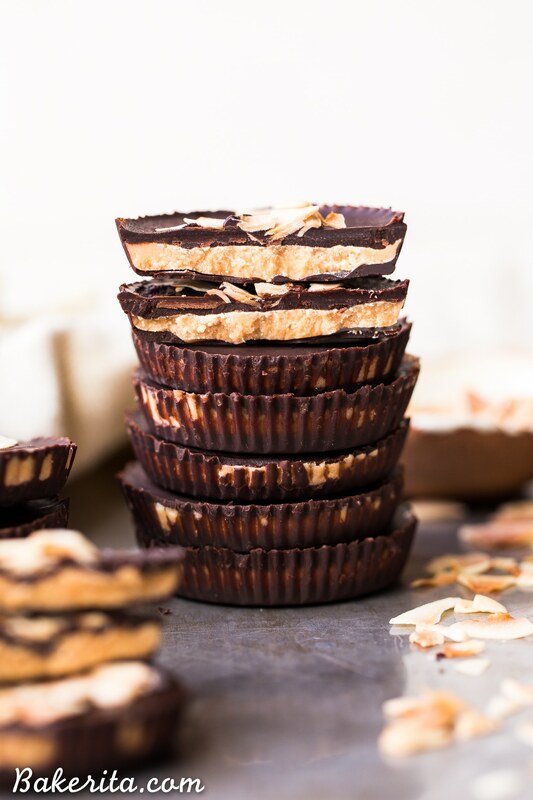 You're going to love these paleo + vegan coconut butter cups. Line a muffin tin with 12 liners. Set aside. Begin with melting the cacao butter, if using, by chopping it very finely. Place in a liquid measuring cup and melt in 20 second increments, stirring between each, until fully melted. It can also be melted over a double boiler. Coconut oil can be melted in the microwave in 30 seconds to a minute. In the same liquid measuring cup, whisk together the melted cacao butter or coconut oil, cocoa powder, and 3 tablespoons maple syrup. Taste it, and add more maple syrup if you want it sweeter. You can also add more cocoa powder if you want it darker. Pour a small amount of the chocolate mixture into the bottom of each liner or mold cavity, until the bottom is thinly covered. Don't use more than half the chocolate mixture for this. Tilt the pan slightly in each direction to bring the chocolate up the sides of each liner a bit. Place the liners in the refrigerator for about 10 minutes to harden. While the chocolate hardens, melt the coconut butter to a liquid state if it’s not already there. This can be done in about 30 seconds in the microwave - take care not to burn it! Once the bottom layer of chocolate is hard, place about 1 tablespoon of the toasted coconut butter over the chocolate. Pour enough of the chocolate mixture over the coconut butter to cover it completely (if at any point the remaining chocolate gets too thick, warm it in the microwave for 10-15 seconds to remelt). Repeat until all are covered. Return to the refrigerator to harden completely. Store at cool room temperature or in the refrigerator (definitely in the fridge if you’re using coconut oil). Hi Lesley, I’m not sure what you mean? I do have a recipe for toasted coconut butter, which you can find by clicking on the ingredient in the recipe card. As do all of your recipes, these look divine! Quick question regarding the cocoa powder — do you use natural, or dutch-processed? Any recommendations? Thanks!! Hi Michelle, you can use either, but I’d use regular cocoa if you have both. Cacao powder also works! omigosh I am so intrigued by that toasted coconut butter! Wondering if you can use paper liners or will the chocolate stick to it when you try to take it off? Yup, you can use them – I used paper liners! Started researching raw cacao butter and was hoping you could share what brand you use/prefer. I made the chocolate strawberry cups with coconut oil but would like to try these with cacao butter. Thanks! Hi Deb! I’ve used cacao butter from Sunfood, Nuts.com, and Santa Barbara Chocolate and it’s been great with all three :) hope you enjoy them!